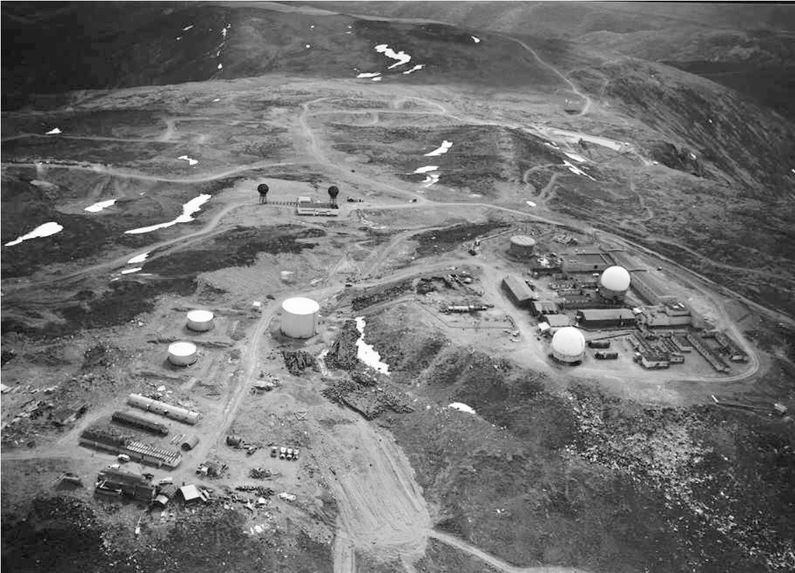 Indian Mountain Air Force Station (1953-1983, 1984-Present) - A Cold War U.S. Air Force Station, part of the Alaska AC&W Radar Network. Initially functioned as a Ground Control Intercept (GCI) radar site, with a Permanent System ID of F-16. Later redesignated a surveillance site feeding manual track data to Murphy Dome Direction Center. Became a minimally attended radar site in 1984 and was redesignated as Indian Mountain Long-Range Radar Site with a JSS ID of A-03. Now feeds radar track data to the FAA Anchorage ARTCC (ZAN) and to the Elmendorf NORAD Regional Air Operations Center (RAOC). Active Long-Range Radar Site (LRRS) with an FAA ID of ZUTO. Indian Mountain Air Force Station Upper Site circa 1961. Indian Mountain Construction early 1950s. 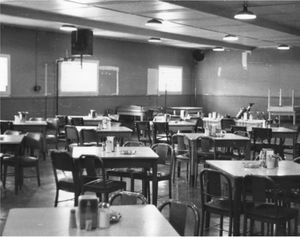 Indian Mountain Chow Hall in the 1960s. The 807th began construction on 18 Jul 1951 by upgrading an airstrip that once served a gold mine and then building an eight-mile road to the top of Indian Mountain. The airstrip came to have a 7.1% slope which was said to be the steepest of the Alaska radar site airstrips. 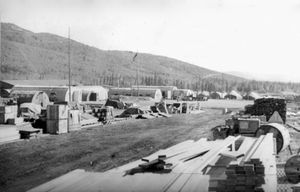 Indian Mountain was the only Alaska split site not to have a tram connecting the upper and lower sites and it was one of two sites supplied completely by air. Initial radar equipment included the FPS-3 search radar. A FPS-6 height-finder radar was added in 1957. The radars were upgraded to one FPS-20 search radar and one FPS-90 height-finder radar. Later the FPS-20 was upgraded to a FPS-93A search radar. Further reductions came on 1 Oct 1977 when the Alaska Air Command (ACC) contracted with RCA Services for site support services. This was a part of an Air Force effort to reduce remote tours. 103 military positions were deleted. The remaining were primarily in operations. JSS common digitizers were installed on the AC&W radars sites, including Indian Mountain, by 1982. 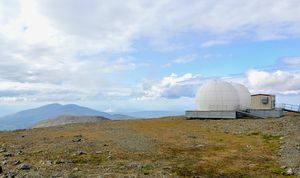 This upgrade enabled transmission of radar track data via satellite to the new Elmendorf JSS Regional Operations Control Center (ROCC) near Anchorage. The Elmendorf JSS ROCC was activated on 14 Jun 1983 and that event triggered a series of events that included the closure of the AC&W sites, the disbandment of the AC&W Squadrons, the creation of Long-Range Radar Sites (LRRS) with full contractor operation and maintenance and new FPS-117 3D radars. The Indian Mountain AFS was deactivated on 1 Nov l983 even before the FPS-117 radars were installed. Indian Mountain LRRS Contractor Returning from the Upper Site 2005. Indian Mountain LRRS FPS-117 Radome on the Upper Site. Indian Mountain LRRS Interconnected Double Geodesic Domes on the Lower Site in 2009. A new FPS-117 Minimally Attended Radar (MAR) was installed in July-September 1984, was operational on 10 Oct 1984 and was re-designated as Indian Mountain Long-Range Radar Site operated and maintained by contractors. 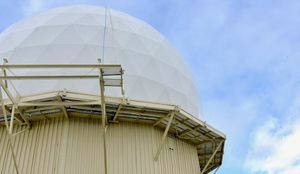 The Long-Range radar site was connected to the Elmendorf JSS Regional Operations Control Center (ROCC) which was activated on 14 Jun 1983. The FPS-117 radar fed data to the ROCC FYQ-93 computers via satellite. By 2011 the MAR FPS-117 radars were outdated and increasingly unsupportable because parts and components were no longer available. In 2011 the U.S. Air Force awarded Lockheed Martin $46.8 million in contract options to begin modernization of 29 long-range radars. Under the EPRP contract, Lockheed Martin was to modernize 15 radars in Alaska including Indian Mountain. The last FPS-117 site was upgraded in June 2015. The physical plant of the site was originally divided into an upper main site, a cantonment area below. The upper site housed the radar towers, operations, and backup generators. The cantonment area housed the enlisted quarters (BAQ), the bachelor officer's quarters (BOQ), the orderly room, the dining hall and other support areas in a single large two-story composite building. A separate recreation hall was connected to the composite building. No family housing was provided as this was considered a remote unaccompanied tour (1 year). In the 1980s Indian Mountain received new composite buildings to house MAR facilities. 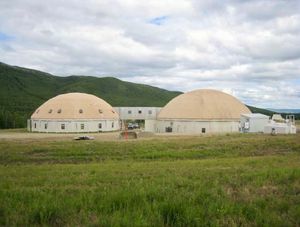 The untraditional structures consisted of two aluminum, double geodesic domes, one housing personnel, and the other housing industrial operations with a connecting passageway. Indian Mountain Satellite Earth Terminal Radomes on the Upper Site. The Indian Mountain WACS was operational on 7 Feb 1958. Facilities included a 4,480 square-foot equipment building that was originally comprised of four separate buildings and three POL storage tanks with a capacity of 2,550 barrels. A single composite building replaced the original structures in 1961 at a cost of $2,280,000. The Indian Mountain WACS was inactivated in May 1979 and replaced by an Alascom-owned satellite earth terminal. 8 Dec 1952 - Activated, 160th AC&W Group. 5 Feb 1953 - Assigned to 548th AC&W Group. 15 Jul 1977 - Assigned to 531st AC&W Group (later other misc units). Active long-range radar site but most of the old AC&W site buildings have been demolished. The site has also had an environmental remediation project that has further erased signs of the old AC&W site and the White Alice tropo site. The facilities that remain from the various periods of activity are listed below. Location: Hughes in Yukon–Koyukuk Census Area, Alaska. Denfeld, D. Colt Ph.D., The Cold War In Alaska: A Management Plan For Cultural Resources, 1994-1999, U.S. Army Corps of Engineers, August 1994, 327 pages, Pdf, page 124, 156, 236, 172-173. History of the Aircraft Control and Warning System in Alaska: Air Defense of Arctic Skies, Argonne National Laboratory, Illinois, 2002 updated 2013, 140 pages, Pdf, page 57-59. Reynolds, Georgeanne Lewis, Historical Overview And Inventory: White Alice Communications System, U.S. Army Corps of Engineers Alaska District, April 1988, prepared for USAF, Alaskan Air Command, Elmendorf Air Force Base, Anchorage, Alaska, 16 pages, White Alice USACE. This page was last modified 18:34, 5 January 2019 by John Stanton.